The “Monoalbero” is virtually identical to the “Bialbero”version from 1952. The “Monoalbero” (“SOHC”) was designed to adhere to the policies of the FMI in the Formula Sports category. In some races (like the Motogiro) the bike was even equipped with lights and a license plate. It was favoured by most private riders. 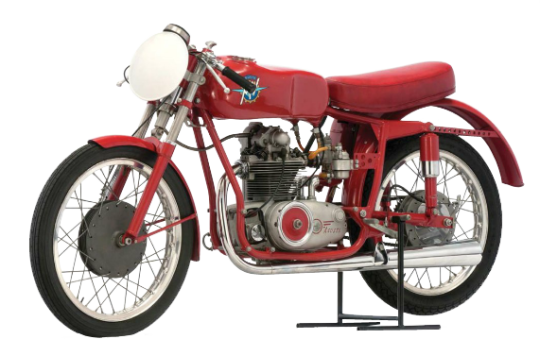 A kit comprised of about 200 pieces was produced to convert it into a “DOHC” version, which showed increased preformance in the 175cc and 203cc (1955). It was the first bike of many champions.